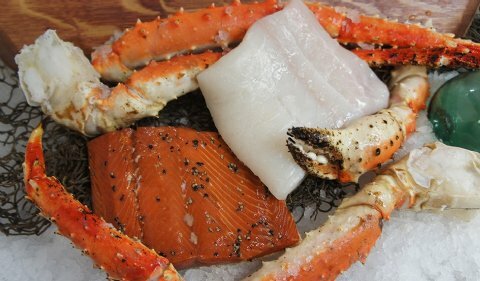 Alaskan Seafood Sampler - King Crab, Halibut & Smoked Salmon. Dinner For Two - 2 lbs. Alaskan Red King Crab, 1 lb. Halibut Fillet, 1/2 lb. Smoked Salmon - FedEx Delivery Included! 2 lbs. Alaskan Red King Crab. 1 lb. Halibut Fillet Portion. 1/2 lb. Smoked Sockeye Salmon. FedEx Overnight Delivery Included. You can earn 320 JACKpot Points! on this product!